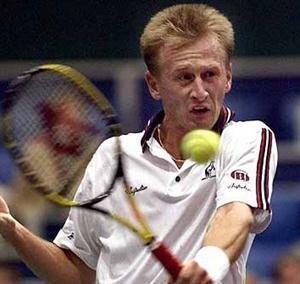 Petr Korda is the winner of the 1998 Australian Open singles event and 1996 Australian Open doubles event. A professional male tennis player for Czech Republic, Petr Korda was been World No. 2 tennis player in 1998. A detailed information about him is given here. Petr Korda is a former professional tennis player who was the winner of the 1998 Australian Open in singles. He is from Czech Republic born on 23 January, 1968 at Prague city. A left hand one-handed, he is a tall player of 6 ft 3 inches height. Petr Korda was a promising junior player in mid 80's. He won the doubles French Open Junior title in 1985 with his partener Cyril Suk. He become professional in 1987. At first he excelled only in doubles. He won his first doubles title at Allianz Sussie Open Gstaad in 1988. He also won the ATP Prague tournament in double category. In 1991, he won his first singles title at ATP Stratton Mountain tournament and the doubles title too. As in his early career, Korda was more successful in doubles than singles. But he started playing more singles event and his first big win in singles came in 1993 Grand Slam Cup, where he beat World No. 1 tennis player Pete Smpras in semi-final and World No. 2 Michael Stitch in a tough final by 2-6,6-4,7-6,2-6,11-9. Later in 1997 U.S. Open, he again beat Pete Sampras. Petr Korda surprised everyone by winning the 1998 Australian Open tournament, his only Grand Slam title in singles. He defeated Marcelo Rios in the final of the tournament in straight sets by 6-2,6-2,6-2. He defeated Karol Kuvera in the semi-final by 6-1,6-4,1-6,6-2 and Jonas Bjorkman in Quarter-final by 3-6,5-7,6-3,6-4,6-2. He achieved his highest ranking of No. 2 after this win. His other Grand Slam win was in doubles at 1996 Australian Open. He partenered Stefan Edberg in it and they defeated the pair of Sebastian Lareau and Alex Ó'Brian in the finals. He was also the runner-up of the 1992 French Open singles event where he lost to Jim Courier in the finals and he also reached the finals of the 1990 French Open doubles event. Petr Korda has played 98 singles matches in Grand Slam events out of which he won 60 and lost 38. Out of 71 doubles matches in Grand Slam events, he won 43 and lost jus 28. This shows his excellent record in Grand Slam tournaments inspite of just two titles, one in singles and other in doubles.